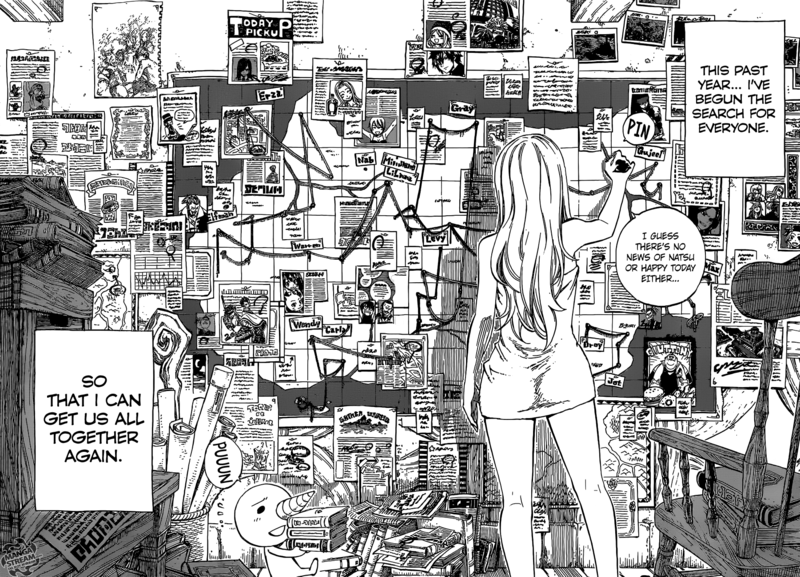 The year is X792, Lucy wakes up in her room and prepares to attend the 4th day of the Grand Magic Games. It’s one year after the battle with Tartaros and Fairy Tails disbandment. Chapati and Yajima commentate on a battle featuring Chrisack and Berik. Lucy arrives late but, she quickly begins taking notes on the battle.She has become an editor in training at Weekly Sorcerer Magazine. 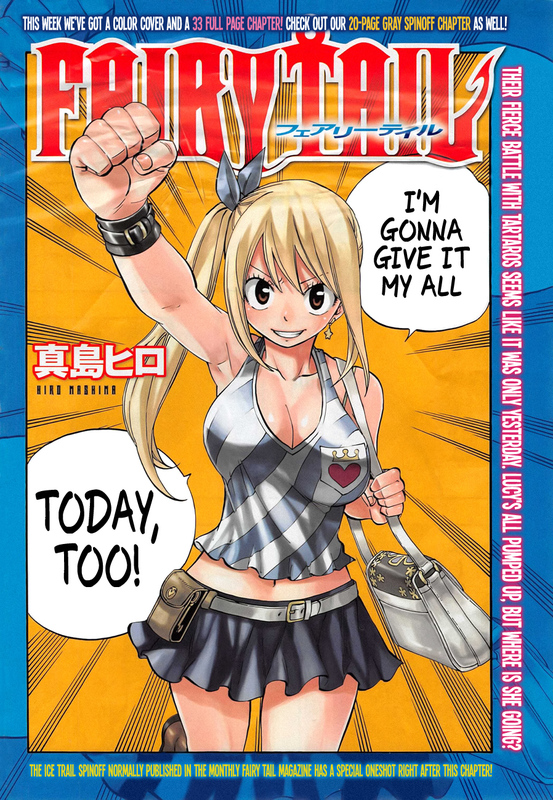 Lucy reveals that the other members of Fairy Tail took the disbandment well. Lucy and Jason meet outside the stadium and Jason admits that he was disappointed because “Sabertooth, Lamia Scale, Mermaid Heel, Blue Pegasus and Quatro Cerberus didn’t participate and neither has Fairy Tail”. She tells him that they are gone and he mentions that it a shame. While taking a bath Lucy reveals that she wants to see her friends again, but is afraid. She say’s that’s why she became a reporter to track her friends. She hopes to reunite them once again but, hasn’t heard about Happy and Natsu. The following day, Dullahan Head battle Skull Millione for the title of “the strongest Guild in Fiore”. Lucy analyzes the fighters and concludes that “Skull Millione is at least twice as strong as Chapati, but they have hidden their strength to make more money in bets”. Skull Millione wins easily, but a hooded walks into the stadium. Lucy is quickly intimidated by the magical power of the intruder, warning the other to get back. 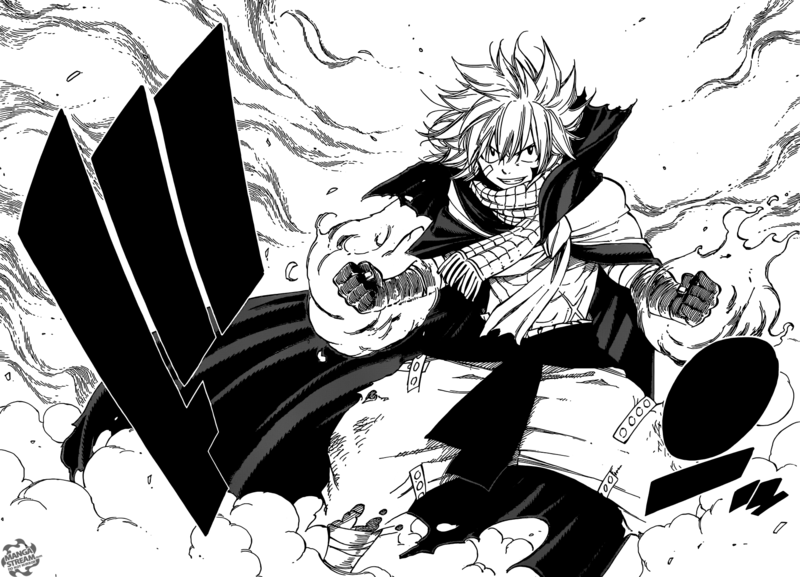 It is revealed to be Natsu, with a new level of fire magic. He and Happy greet Lucy as Natsu plans on taking on all fighters. I think that Fairy Tail being disbanded was and interesting plot point. However, it is clearly that “Fairy Tail” will probably reform in some way. The power increase of Natsu, while not surprising is impressive. I’m excited for the new story arc and review the chapters.